To a better city by sharing. Sharing Economy is fast spreading worldwide. It starts from space sharing, such as home or office sharing, then extends to goods, skill, and time sharing. By sharing all the values within the community, the new life and working style is changing people's old thinking mode. Therefore, a new way of living brings into the city revolution, the idea of "Sharing City" will activate the economic effects and start to soak in every corner of the world. The urban issues in Japan, such as the aging problem, population reduction, undeveloped child care environment…etc. Isn't it the best timing to collaborate with local governments and sharing services to create a sustainable city and realize the "Future City Development"? The SEAJ connects with sharing cities around the country to promote future where everyone can live easily. Your city can be changed by the way of sharing. The city which utilizes sharing economy services to tackle regional issues is considered to be a sharing city. Do you want to build a "sharing city" with new urban model which collaborates with sharing services and local governments? 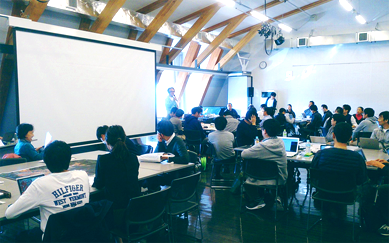 The educational program which aim to become sharing city by introducing public service of "sharing economy." The "Sharing City Seoul" is initiated by Seoul Metropolitian Government(SMG). SMG takes the lead to build infrastructure to support sharing start-up companies. In Seoul, there are many urban issues, such as traffic congestion, environmental problems, social security...etc. To tackle these issues, SMG utilzes sharing economy as a solution for their administrative tasks. They introduced car sharing services in 527 different places in the city, and began from sharing mobility, then extended to goods sharing (cloth, book), space sharing (hanok, guest house), and skill sharing (meal, art). Sharing services has been deployed in a variety of fields in Seoul. In addition, the "public assets," such as meeting rooms, auditoriums, parking lots, which owned by governments also be opened to the public outside office hours or holidays. Sharing economy is taking root in the city steadily by setting up the public WIFI and opening the city data. Amsterdam’s rich heritage and culture, its spirit of commerce, its innovative infrastructure, its live-ability and its creativity set it apart from other major European cities. These aspects, together with the fact that more than 84% of the ‘Amsterdammers’ is willing to share, make the city the ideal platform for the sharing (or: collaborative) economy to flourish on. shareNL, a private sharing economy knowledge platform initiated their idea to make Amsterdam into a Sharing City. shareNL created a network of ‘ambassadors’ throughout the city. The city is formed by not only its citizens and the municipality, but also entrepreneurs, enterprises and for example knowledge institutions shape the city of today. Early 2015, all ambassadors convened and together they officially launched "Amsterdam Sharing City." The municipality was involved from the very beginning. They already stood out by being one of the first municipalities in the world to develop regulations around Airbnb. The purpose of the Sharing City initiative is to create a playground for pilot projects. An urban living lab where all stakeholders pilot with this new phenomenon and share insights and experiences. Amsterdam already houses a large number of promising sharing economy platforms, but it’s also up to more ‘traditional’ organizations like for instance SMEs, NGOs and local governments to start addressing the sharing economy. From startups to corporates, from community center to public library, from an insurer to the airport: they’re all ambassadors putting Amsterdam on the map as a city that has sharing on its mind.